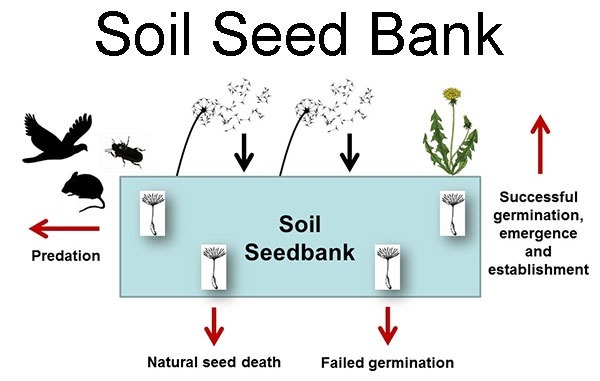 Seed bank – Dispersal can occur through time. Plant seeds can lie dormant for many years. When a seed does not germinate after a period of dormancy, many of the plants which were alive when the seed was produced may have died. Plants can disperse in time if the seeds join the dormant seed bank. The store of seed, in the soil is called the seed bank. Often seeds will germinate on a patch of soil which has been disturbed. These seeds from seed bank may have been dormant when they come to the surface of the soil. Dormancy can be broken by a number of environmental features such as changes in temperature, carbon dioxide or water content of tile area surrounding the seed. Different environmental stimuli will trigger germination in particular species. Annual weed seeds in fields of grain often germinate after the soil has been ploughed and seedlings may be found of species which have not grown in that area for many years. Dormancy in seeds is very important to plant populations. Even if all the growing plants in a population die because of some disaster or adverse conditions of environment, seeds may survive and subsequently give rise to a new group of plants. A seed bank regulates the population size even under normal conditions. In good growing years many plants set seed and a large number of seeds are added to the seed bank. If a poor year follows, there will a few new seeds, but- seeds germinating from the seed bank helps to maintain the number of growing plants in the population. which a population and join another are said to have dispersed. In plants main dispersal units are seeds or spores. Fungi also produce spores as main method of dispersal. Most seeds and spores do not travel very far and remain in the same populations their female parent. Some seeds, however, can travel very large distances with the help of special structures and can join other populations when they germinate. Such methods of seed dispersal include feathery attachments to catch the sticky or hooked seeds to attach to animals and floatation devices. Fern and fungal spores are much lighter than seeds and are often carried very large distances by air. current in rare situations whole mature plants can be moved to new sites, for example in aquatic habitats during floods.